We are pleased to announce stop market and stop limit orders are available on GDAX. Stop orders allow customers to buy or sell when the price reaches a specified value, known as the stop price. This order type helps traders protect profits, limit losses, and initiate new positions. This will place a stop market order. 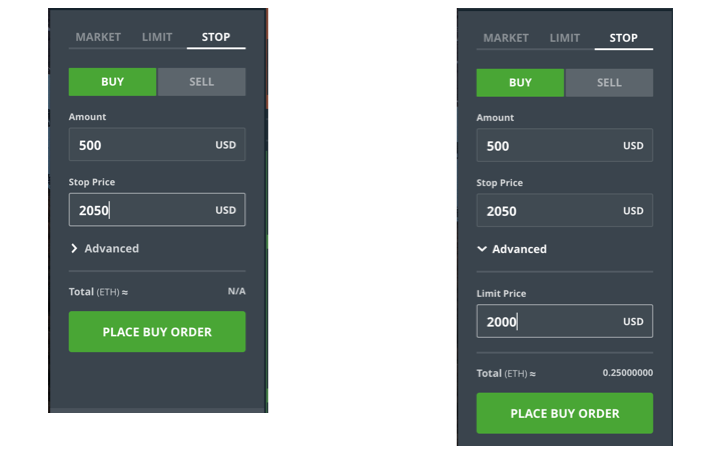 If you would like to place a stop limit order, simply enter a “Limit Price” price under the Advanced section. All stop orders are immediately visible on the Open Orders panel and can be cancelled anytime by clicking the “X” in the status column. Stop orders can also be entered programmatically using the /orders endpoint in the GDAX API. Sign up or login to your GDAX account to start trading today.